I have the perfect holiday dessert for you! Maple Cinnamon Cheesecakes. OMG. These are so good and perfectly bite sized. 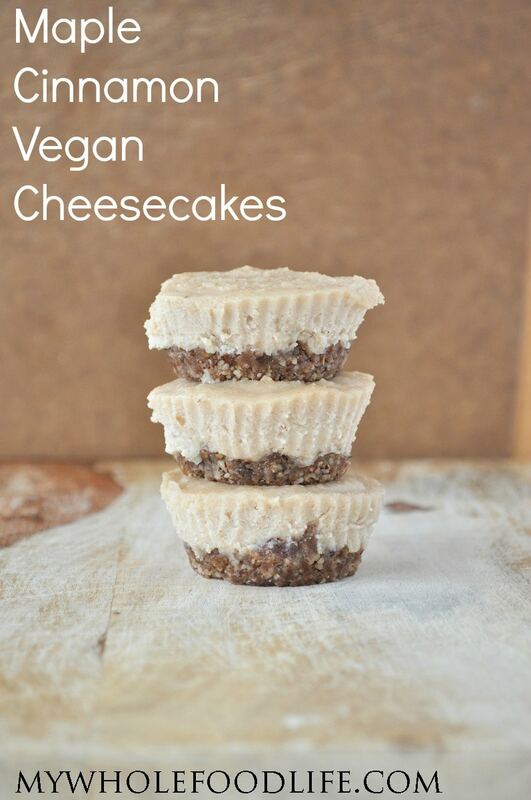 These vegan cheesecakes are super easy to make too. If you preferred, you could probably make 1 large cheesecake as well. 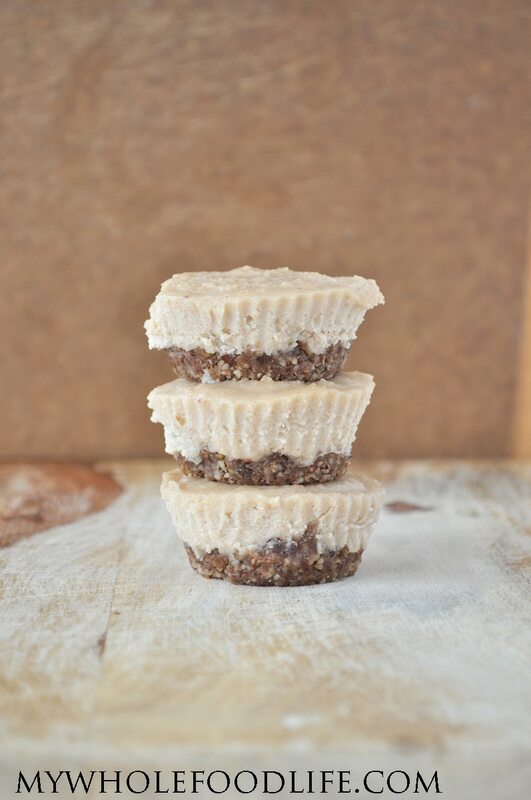 These Maple Cinnamon Cheesecakes are vegan, gluten free and paleo. The gingerbread crust is to die for! I promise they will be a hit at any holiday party. Perfect for those that have dietary restrictions. I got 12 mini cheesecakes out of my batch. This is a dessert you can make ahead of time so you will not feel stressed. It should last a couple weeks in the fridge too. I could see my 3 ingredient chocolate drizzled over the top of these. Yum! The perfect holiday treat! Bite sized and great for parties! Combine all the ingredients in a food processor . You will see the mixture start to get to a crumbly like consistency. Be careful not to over process or you will end up with pecan butter. Once the mixture looks done, you can press a little into the bottom of each muffin cup. I used standard sized pans . Place them in the fridge while you make the cheesecake part. Make sure your cashews have been soaking overnight. Drain and rinse them. Place them in a food processor with all the other cheesecake ingredients. Mix until everything is smooth. Spoon a little of the cheesecake mixture into each muffin cup. Once that is done, place them in the fridge to firm up. It can take up to 12 hours for the cheesecakes to get fully firm. Keep these stored in the fridge. You can probably freeze them as well. I have not tried that though. OMG these look delicious! Anything maple and cinnamon wins my heart over! Making these ASAP, because I NEED them ASAP! Sorry for all the CAPS... I'm just soooo excited!! Did you use silicone muffin cups? Greased? I use the silicone and I don't have to grease them. These were nothing short of amazing! I tried to make pumpkin cheesecake in little jars for Thanksgiving last year, but but it didn't work out so well ( not Melissa's recipe). I tried these last week and they are incredible!!! I'm looking forward to making these for Thanksgiving this year!! Yay!! Glad you liked them Hollie! I'd love to make these but have no cashews, but a jar of cashew butter, do you think it would work and would I use less? How much coconut oil? I'm getting a weird little symbol in front of "cup"
What would be a good substitute for someone allergic to cashews (but not tree nuts)?